Schwarzenegger is famous for having an excellent physique and an unquestionable work ethic. One of his best body parts is his chest, so throughout this article we’re going to tell you about his chest workout. You’ll learn about the techniques that he used to develop his chest and how you can use these very same techniques to get results in the gym. You might have seen some people in the gym trying to build their “inner chest”, most people assume that this muscle can be worked by doing cable flyes or similar exercises. However, this isn’t a muscle at all. By learning basic anatomy, you’re going to have a much better time in the gym because you’ll understand why you’re doing what you’re doing. Pectoralis Major – this muscle has two “heads” (you can think of these as sections), the clavicular head (upper chest), and the sternocostal head (lower chest). Pectoralis Minor – this muscle is actually underneath the pectoralis major and its main use is to keep the scapula steady. To conclude this section, there is no “inner chest”, only upper and lower. The pectoralis minor is worked alongside the pectoralis major in most chest exercises, so don’t worry about that. Schwarzenegger’s routine focused on bodybuilding, so you’ll find that there will be a moderate amount of sets, a moderate amount of reps, and relatively short rest periods. 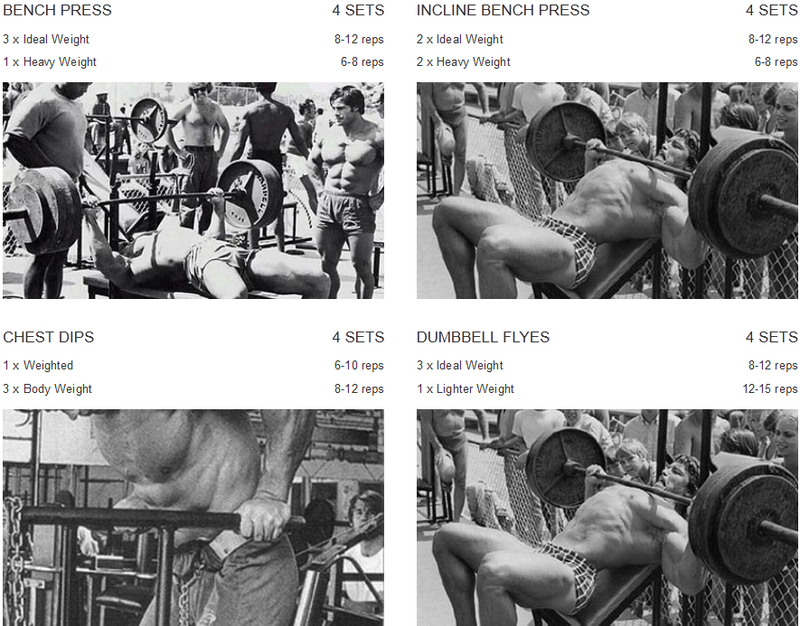 When it comes to bodybuilding, a general rule of thumb for exercises is 3 sets of 8-12 reps. Schwarzenegger had a very similar approach and you’ll notice that in the next section. With regards to rest periods, you should rest until you are comfortable with doing another set, but make sure you don’t wait too long. Anywhere from 60-90 seconds after each set is good. Before you get started with Schwarzenegger’s chest workout, make sure that you properly warm-up first. We recommend a few warm-up sets on the bench press; start with the bar, and then progressively add heavier weight until you reach your working set. Progression is something that you definitely don’t want to forget about; if you want to see results in the gym, you have to think about progression. This means that you should always try to increase the amount of reps that you do, or the amount of weight that you lift. If you managed to do 8 reps on the bench press, then try to get 10 reps next week. Once you get a full 12 reps then increase the weight and try to hit 8 reps (this is because the exercise is 8-12 reps). So, if you lift 65kg/135lbs for 3 sets of 12 reps on the bench press one week, try to lift 67.5kg/140lbs for 3 sets of 8 reps next week. As you can see, Schwarzenegger relied on the basics when he wanted to build his chest, and that’s exactly what you should be doing! There is no need to incorporate all of these fancy exercises into your workouts, instead you should be focusing on results. The chest workout outlined above is a great workout to get started with; as you get more experienced in the gym, you might even want to adjust the workout the better meet your body type and your goals.